119 x 66 x 42mm to 180 x 119 x 62mm, provide increased security by preventing access to the interior without removing the enclosure from the surface to which it is attached. The styled lids include a recess suitable for mounting a membrane keyboard and are also fitted with PCB mounting bosses. 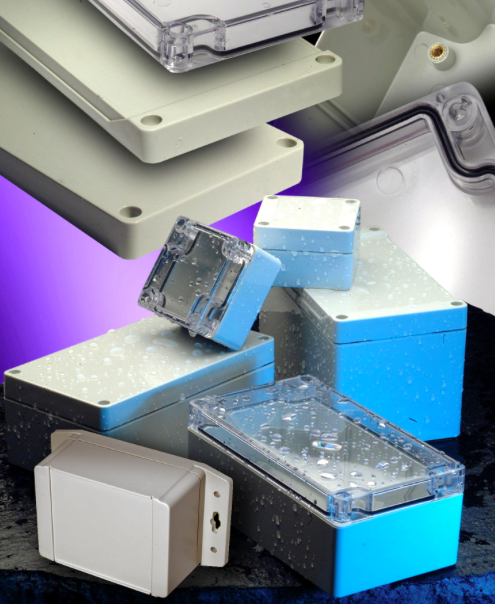 Bases are fitted with internal DIN rail mounting tabs in all but two sizes and standoffs for mounting PCBs or optional internal panels are provided in all versions. To avoid any corrosion problems the base inserts and self-captivating lid screws are both stainless steel, located outside the gasket, with additional holes in the base. An optional foot kit is also available. Optional steel panels suitable for mounting heavy components can be fitted to the integral mounting points in the base, the bases also feature moulded slots to enable 1.6mm thick PCBs to be mounted vertically into the enclosure.